Getting my first package from NaturallyCurly.com was beyond exciting. 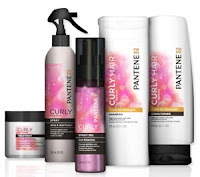 I literally ripped open the box the moment it was delivered and was happy to see the Pantene Curly Hair Series on deck for my first review. The Curly Hair Series features shampoos, conditioners, treatments, and stylers all aimed at offering frizz control and curl definition. I received the Dry to Moisturized 2-in-1 Shampoo + Conditioner, Light Conditioning Detangler, Heat Protection & Shine Spray, Curl Shaping Gel, and the Fine Hair Solutions Ultra-Light Moisturizing Treatment (which could have possibly been a mistake but I still chose to use and review). I've never been a fan of 2-in-1 products because I never felt the conditioning aspect was substantial enough. It's a great idea, but I believe more beneficial to those that don't require intense conditioning for their hair. This was more of a conditioning shampoo that didn't leave my hair feeling stripped, but not something I would incorporate into my routine and make a staple product. The name is right because this was a super light moisturizer. I don't know if I was sent this product in error because it's from their Fine Hair Solutions line, but it definitely didn't offer the level of moisture I needed. I think this product would be good for those with a looser curl pattern whose hair is easily weighed down. Ahhh, the Curl Shaping Gel! I had a love/hate relationship with this product. I loved the LOOK of the results it offered me, but loathed the actual feel of my hair. I used this stuff everyday for a week and ended up with overly dried locks. Seriously, my hair was on its last leg and needed life support to bounce back from continued use of this product. I tried a few combos to make this work, but have yet to strike gold. I'll keep playing around with this product, but definitely can't use it daily... Maybe once every other week. I didn't get a chance to straighten my hair during the week I tried these products due to being consumed with trying to find a combo that made the Curl Shaping Gel work lol. I will review this once I do my next blow out. My hair is rather easy to detangle so I can't say this product did much for me in that area. It is also marketed as a curl refresher, but while it made my hair wet it also dried it out when I used it the next morning. I'll have to stick with water as my preferred curl refresher.